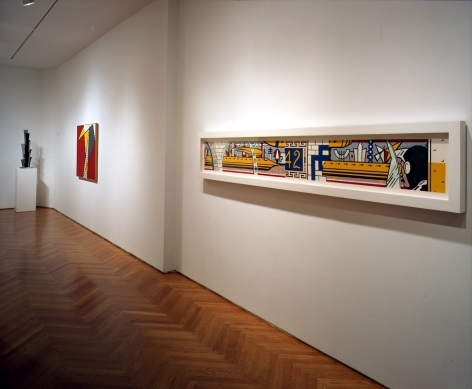 New York, June 2002 - Mitchell-Innes & Nash, the exclusive representative of the estate of Roy Lichtenstein, is pleased to announce the installation of the Roy Lichtenstein Times Square Mural and a corresponding exhibition at the Madison Avenue gallery. The unveiling of the mural in the Metropolitan Transportation Authority’s Times Square subway station will be held on September 5, 2002. 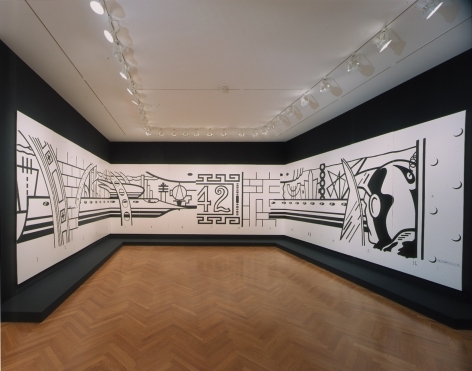 Roy Lichtenstein: Times Square Mural, the exhibition of source materials and related works at Mitchell-Innes & Nash, will be on view from September 5 through October 19, 2002. 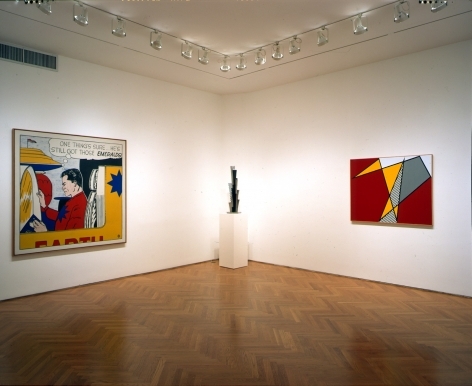 The mural’s unveiling and the corresponding exhibition celebrate an important occasion in New York City history, when New York residents and visitors can share in Lichtenstein’s vision of his hometown. Roy Lichtenstein (1923-1997) was commissioned twelve years ago by the Metropolitan Transportation Authority (MTA) Arts for Transit program to create a mural for the Times Square subway station at 42nd Street and Broadway. Standing 6 feet high and 53 feet long the mural provides a skyline view of the futuristic city. The vibrant work includes various elements of science fiction, as well as allusions to the World’s Fairs held in New York in 1939 and 1964, and references to his own work from previous decades. Lichtenstein fabricated the mural in 1994 of porcelain enamel on steel and it is being permanently installed in its intended place in the Times Square subway station. The mural is a gift to all New Yorkers from the artist. The Times Square subway station is New York City’s largest, serving nearly 500,000 users daily. In conjunction with the unveiling of the Times Square Mural, Mitchell-Innes & Nash and the Roy Lichtenstein Foundation will exhibit the primary and auxiliary materials for the mural at the gallery. The exhibition will include the 53-foot full-scale black-and-white maquette of the mural; preparatory drawings and collages; various source materials including comic books; and related paintings and sculpture by the artist. 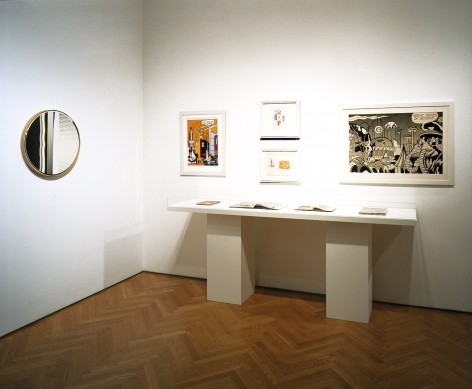 In addition to photographs of the artist at work on the mural and collage, the show features many works that have never before been on public view, providing a unique glimpse into Lichtenstein’s creative process. Speaking about her late husband, Dorothy Lichtenstein, the artist’s widow, has said: "Roy loved New York and rode the subway from the time he was a boy. He would be so pleased that the mural he created for the Times Square subway station is being installed for the enjoyment of New Yorkers and visitors to his native city." The exhibition Roy Lichtenstein: Times Square Mural will be on view at Mitchell-Innes & Nash from September 5 through October 19, 2002. An opening night reception will take place at the gallery on Wednesday, September 4, from 6:00 to 8:00 pm. The exhibition will be accompanied by a fully illustrated interpretive catalogue with an essay by Harvard University scholar Scott Rothkopf and a new short story by acclaimed author Rick Moody, commissioned especially for the occasion. Gallery hours are 10:00am to 5:00pm, Tuesday through Saturday. 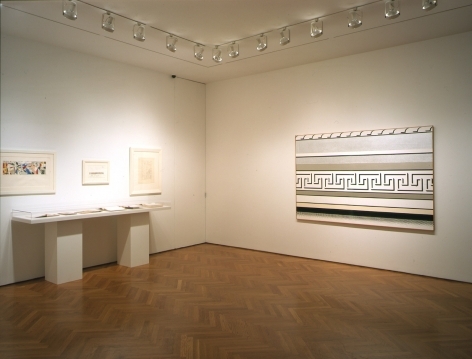 To preview the exhibition, contact Leta Grzan at Mitchell-Innes & Nash or visit the website at www.miandn.com. MTA Arts for Transit encourages the use of public transit by presenting visual and performing arts projects in subway and commuter rail stations. For press inquiries about the MTA or details about the mural in Times Square, please contact: Lisa Schwartz at (212) 878-7178 or via email at lschwart@mtahq.org. For images or press information about the gallery exhibition Roy Lichtenstein: Times Square Mural: Stacy Bolton tel: (212) 721-5350 email: sbstul@aol.com.